Size - approx 6inches x 4 inches. Pack of 10, buy as many packs as you need. Professionally printed personalized invitations & envelopes. Printed one side, postcard style onto very high quality satin 260lb card. You can specify all of the text so any invitation / card can be adapted for any occasion. We can also alter fonts and colours as you wish. To personalize, please either leave us a gift message, send us an amazon message, or email us the details, along with your order number & name to info@redheartprint.com or call us on 618-708-7906. Please check your spelling carefully as we copy it as you request it. Please only use capital letters where appropriate as per our example. We will space all text correctly prior to print. size - approx 5.9 inches x 4 inches. Professionally printed personalized invitations & envelopes. Printed one side, postcard style onto very high quality satin 260 lb card. 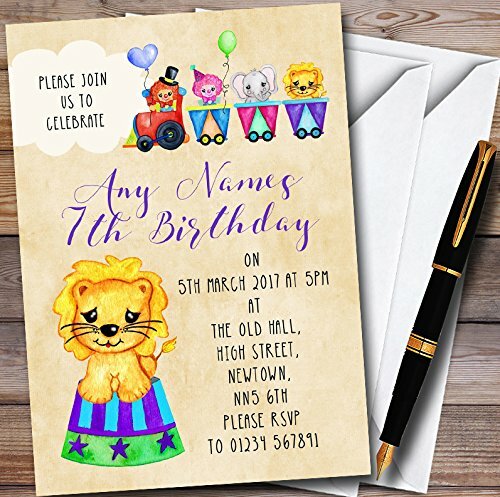 You can specify all of the text so any invitation / card can be adapted for any occasion. View More In Invitations & Cards.